On April 23, 1943, the seventy-man crew of the USS Grenadier scrambled to save their submarine—and themselves—after a Japanese aerial torpedo sent it crashing to the ocean floor. Miraculously, the men were able to bring the sub back to the surface, only to be captured by the Japanese. 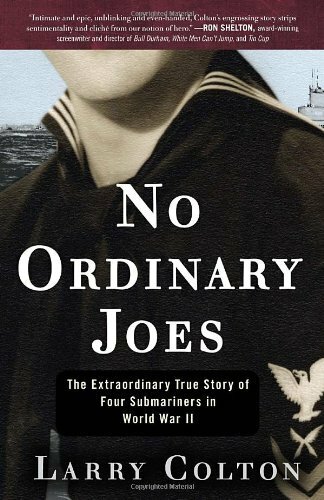 No Ordinary Joes tells the harrowing story of four of the Grenadier’s crew: Bob Palmer of Medford, Oregon; Chuck Vervalin of Dundee, New York; Tim McCoy of Dallas, Texas; and Gordy Cox of Yakima, Washington. All were enlistees from families that struggled through the Great Depression. The lure of service and duty to country were not their primary motivations—they were more compelled by the promise of a job that provided “three hots and a cot” and a steady paycheck. On the day they were captured, all four were still teenagers. Together, the men faced unimaginable brutality at the hands of their captors in a prisoner of war camp. With no training in how to respond in the face of relentless interrogations and with less than a cup of rice per day for sustenance, each man created his own strategy for survival. When the liberation finally came, all four anticipated a triumphant homecoming to waiting families, loved ones, and wives, but instead were forced to find a new kind of strength as they struggled to resume their lives in a world that had given them up for dead, and with the aftershocks of an experience that haunted and colored the rest of their days. Author Larry Colton brings the lives of these four “ordinary” heroes into brilliant focus. Theirs is a story of tragedy and courage, romance and war, loss and endurance, failure and redemption. With a scope both panoramic and disarmingly intimate, No Ordinary Joes is a powerful look at the atrocities of war, the reality of its aftermath, and the restorative power of love. This was an insightful book on what was going on in the Submarines and Japan during World War II, but it was a very rough book . The four men in this book were all rough and endured much. They talk about some of what happened to them after they were captured by the Japanese which is a tough section of the book to read. I would also say that this book is for high school and up. The book openly talks about their immorality when in Hawaii and Australia and during their vacations on the islands during the war. These were not perfect men, but they still have amazing stories that are worth learning about.